The main purpose of a CAE plugin is to export a grid model. To do this, the plugin must convert the grid data as represented by Pointwise into a format supported by the solver the plugin is targeting. To do this conversion properly, you must have a thorough understanding of the Pointwise grid model (PWGM). For this post, I will focus on the unstructured PWGM. The structured PWGM will be covered in a future post. While there is much in common between the structured and unstructured PWGM, there are fundamental differences that make them better covered in two articles rather than one. Each Handle type has one or more SDK functions that is used to query the entity that the Handle represents. The SDK uses a function naming scheme in which the name’s prefix reflects the entity Handle being queried. For example, all functions beginning with PwDom take a PWGM_HDOMAIN as their first parameter (the domain’s this pointer). You can also extract information from a Handle using various SDK macros. See the Modules/PWGM-API Opaque Data Handle Types section of the CAE Plugin SDK documentation for the details. The unstructured PWGM is arranged in a hierarchy. The root of this hierarchy is the grid model itself. At export, the grid model’s Handle is passed to the plugin’s runtimeWrite() function using the PWGM_HGRIDMODEL model parameter. The unstructured PWGM is divided into two distinct, yet related, views. The first view provides cell centric access to the grid model. The second view provides face centric access to the grid model. The face centric view API is not available in the current 1.0 R3 version of the Plugin SDK. However, the coding is finished and is being tested. I hope to have it released in the next few weeks. UPDATE: The face centric view API is now available for use in Pointwise v17.1 + Plugin SDK v1.0 R4 ! One array of Blocks, each with an array of cell Elements and a single Condition. One array of Domains, each with an array of face Elements and a single Condition. One array of all Block cell Elements. One array of all cell face Elements, including the faces that lie on the grid’s boundary and the faces that are internal to the grid. It is important to note that the same array of Vertices is used by both the cell centric and face centric views. As hinted to above, the vertices are the common relation that ties the two views together. The complete grid model hierarchy is represented in the figure below. A gold star for anyone who noticed that the discussion above did not mention 2D grids versus 3D grids. That is because the PWGM makes accessing the grid data (mostly) independent of the grid’s dimensionality. A Block is collection of block Elements, all of which are assigned a common volume Condition. Each block is identified by a unique, integer index. The indices range from 0 to the number of blocks in the model (Nb) minus 1 (0 … Nb-1). A Domain is a collection of domain Elements, all of which are assigned a common boundary Condition. Each domain is identified by a unique, integer index. The indices range from 0 to the number of domains in the model (Nd) minus 1 (0 … Nd-1). A Vertex is a single XYZ coordinate identified by a unique, integer index. The indices range from 0 to the number of vertices in the model (Nv) minus 1 (0 … Nv-1). An Element is an ordered collection of Vertex indices. The index order defines the Element’s connectivity (see Module/Cell Connectivity). A Condition is a set of two user defined and two solver defined attributes. A plugin accesses this entity hierarchy using the same function calls. The distinction between 2D and 3D only comes into play in the Elements. For example, the Elements of 3D blocks are hexes, prisms, pyramids, and tets. The Elements of 3D boundary domains are tris and quads. Similarly, the Elements of 2D blocks are tris and quads. The Elements of 2D boundary domains are bars (lines). 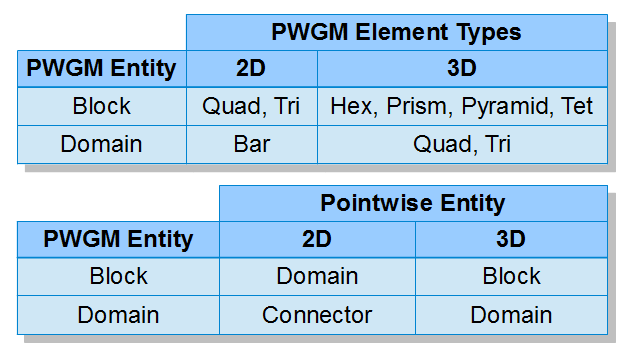 The tables below summarize the relationship between PWGM grid entities, their Elements and the corresponding Pointwise grid entities. 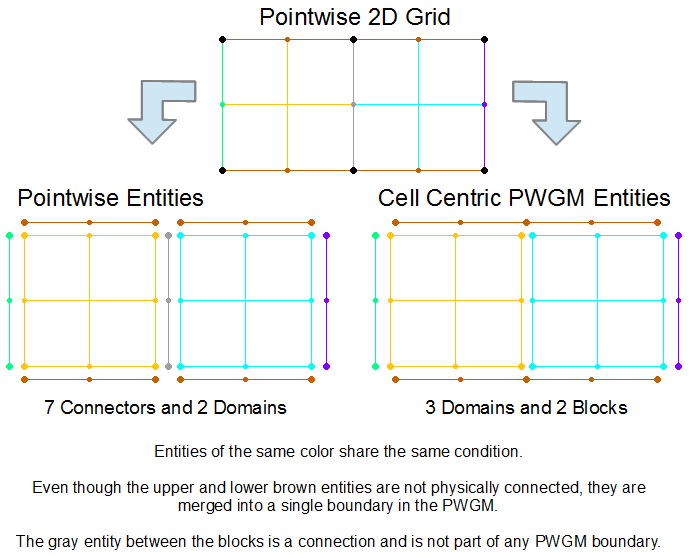 Before the grid you created in Pointwise is passed to the plugin, Pointwise boundary entities (domains in 3D or connectors in 2D) sharing the same boundary condition are merged into a single PWGM Domain. As a result, the number of PWGM Domains may not be the same as the number of Pointwise boundary entities, depending on how Pointwise boundary conditions are applied to a grid. Conversely, Pointwise volumes (blocks in 3D or domains in 2D) sharing a common volume condition are not merged. This means that the number of PWGM Blocks always will be equal to the number of Pointwise volume entities. The figure below illustrates how a 2D Pointwise grid appears to a plugin for cell centric views. How boundary merging changes a Pointwise grid before it is passed to a plugin (cell centric view). In the face centric view, the merging of boundary and volume conditions is not meaningful because Blocks and Domains only are accessed as cell and face Elements. The figure below illustrates how the same 2D Pointwise grid appears to a plugin for face centric views. How a Pointwise grid appears to a plugin in the face centric view. The grid model’s XYZ vertex data is obtained using the functions listed below. The specifics of a particular export format will determine which of these functions to use. See the plugin documentation for details. The PWGM provides “streamed” access to the faces of the face centric view. They are streamed in the sense that the faces are made available to the plugin one at a time. Once the plugin has finished with a face Element, it cannot access the face Element again without restarting the stream from the beginning (unless you make local copies of the face data in the plugin). We decided to use face streaming in the PWGM to minimize the amount of additional memory consumed during export. Pointwise does not explicitly store grid face information. 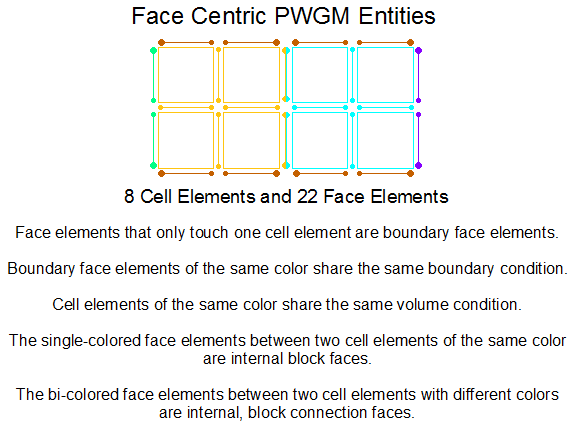 As a result, to provide the face centric view, the PWGM needs to process the cell centric data and convert it to a face centric representation. Storing the full, face centric view for enumerated, random access can more than double the amount of RAM already required by the cell centric view. And, as many of our customers already know, large grid models can strain the RAM limits of many modern computers. The addition of non-streamed face Element data may exceed a computers available RAM and prevent some large grids from being exported at all! A plugin initiates a face streaming session with a call to the PwModStreamFaces() SDK function. This function accepts a PWGM_ENUM_FACEORDER value, three callback functions, and a user-data pointer. The optional user-data pointer can be set to null or it can be used to pass plugin specific runtime information to all phases of the streaming session. The user-data pointer is passed to each of the three callbacks. The face order value controls how the faces are grouped during streaming. The supported orders are listed below. The faces are streamed to a plugin using the three callback functions. The beginCB() callback is invoked by the PWGM once at the beginning of the streaming session. This callback receives the number of the boundary, internal and total faces that will be streamed. PWGM_ENUM_FACEORDER order;   // requested cell face stream sequence order. PWP_UINT32 totalNumFaces;    // total # of faces in model (= #Boundary + #Interior). PWP_UINT32 numBoundaryFaces; // # faces in totalNumFaces lie on the model's boundary. PWP_UINT32 numInteriorFaces; // # faces in totalNumFaces that are interior to the model. PWGM_ELEMCOUNTS counts;      // model's total element counts. When the plugin returns from beginCB(), the PWGM begins processing the cell centric data. As faces are completed, they are passed to the faceCB() callback. The information passed to this callback includes the face type (internal or boundary), the face vertices, and the block cell Elements on either side of the face. PWGM_ELEMDATA elemData;     // The face's element data. PWGM_ENUM_FACETYPE type;    // One of the PWGM_FACETYPE_XXX types. PWGM_FACEREF_DATA owner;    // The block element that owns face. // is undefined if type is PWGM_FACETYPE_BOUNDARY. After the last face is passed to faceCB(), the PWGM makes one final call to the endCB() callback. The following example C++ code shows the streaming API in use. // In this example, passing pRti as the PwModStreamFaces(..., void *userData) parameter. // However, any implementation specific value can be used. Armed with an understanding of the unstructured grid model available within the Pointwise CAE plugin SDK, you should be able to create a plugin that adds your solver of choice to Pointwise. As always, if you have any further questions feel free to contact Pointwise support. We are here to help! I will be covering the structured grid model in my next post. In the meantime, you can learn more about the PWGM by clicking on the button below. This entry was posted in Applications, Software and tagged CAE, CFD, export formats, Glyph, grid model, mesh generation, Plugin SDK, Pointwise, software engineering. Bookmark the permalink.